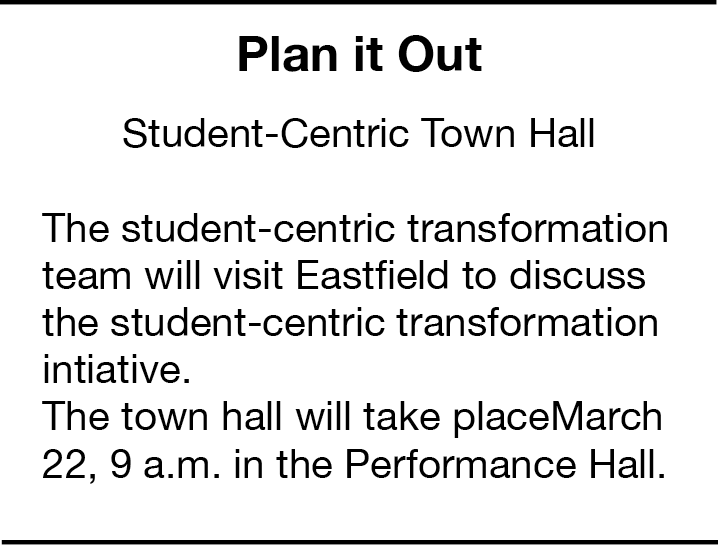 Eastfield will host a town hall March 22 to update the college community on the Dallas County Community College District’s student-centric transformation initiative and offer an opportunity to discuss the changes. The student-centric transformation team and Eastfield president Eddie Tealer will open with a presentation to update the Eastfield community on the initiative before opening up microphones for attendees to ask questions. Speakers will be limited to three minutes to allow for the most participation, according to an email from Tealer. There will also be a virtual town hall on the DCCCD’s Sharepoint website March 28 at 4 p.m. and April 1 at 4 p.m. where members of the college community will have another opportunity to ask questions. Tealer said in the email that many questions will be answered in the virtual forum instead of the in-person town hall. DCCCD chancellor Joe May visited Eastfield last November to discuss student-first initiatives, touching on master scheduling, a plan to increase tuition for textbooks that has since been pushed back, and the idea of high-performing faculty. He received pushback from faculty on some of these issues during that meeting. Other programs that fall into the student-centric transformation initiative include Cedar Valley College’s Early Collegiate Discovery Center and the Office of Student Transfer, as well as a first-year experience program, May wrote in a newsletter to district retirees. El Centro College contributes to the plan with the A&M-Chevron Engineering Academy, which is expanding to every college in the district and changes, May wrote. The Et Cetera will be live tweeting the event here.